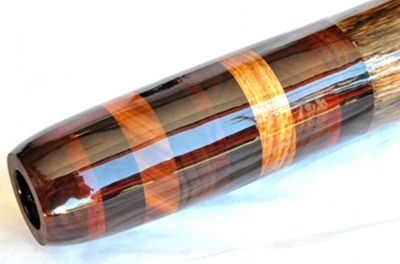 Oh man this one is just a gorgeous didge! I wanted to make a longer mouthpiece on this one and used Walnut from my great grandfathers tree that has been aging for more than 50 years! Interwoven with the Walnut are Padauk, Bubinga, and Canary. This has a great bore on it with a mesmerizing drone full of bass and power. There are so many possibilites when playing this one and with that big bell you will definitely be heard expressing them. Sounds so great at top speed and so clear playing ambient soundscapes. 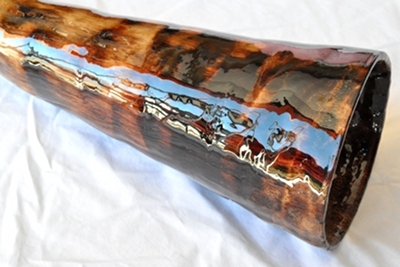 This will definitely turn some heads and be the envy of many a didge player.